The Supreme Court has decided to hear Arizona's appeal of court decisions holding its immigration law, SB 1070, unconstitutional. The ACLU reports that the city council in Fremont, NE has suspended the enactment of its anti-immmigrant resolution that would requires prospective renters to provide the Fremont Police Department with information about their citizenship or immigration status prior to renting any home. Update: Via Politico, Here is a copy of the Complaint filed today. The Department of Justice will file its legal challenge to Arizona's immigration law, SB 1070, as early as today. It will seek an injunction to prevent the law from going into effect. The lawsuit will rely on pre-emption (through the Supremacy Clause) but it's also expected to contain a civil rights claim. 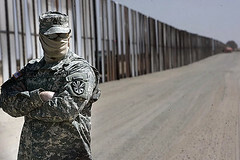 But the filing is likely to have a civil rights component as well, arguing that the Arizona law would lead to police harassment of U.S. citizens and foreigners, said the sources, who spoke on condition of anonymity because the government has not announced its plans. President Obama has warned that the law could violate citizens' civil rights, and Attorney General Eric H. Holder Jr. has expressed concern that it could drive a wedge between police and immigrant communities. The ACLU has put out a travel alert for Arizona in advance of July 4th, warning of racial profiling stops and arrests. American Civil Liberties Union affiliates in Arizona, New Mexico and 26 other states put out the warnings in advance of the Fourth of July weekend. The Arizona chapter has received reports that law enforcement officers are already targeting some people even though the law doesn't take effect until July 29, its executive director said. The alerts are designed to teach people about their rights if police stop and question them. President Obama will meet with Arizona Governor Jan Brewer today. Brewer intends to ask Obama for more federal assistance in securing the border. 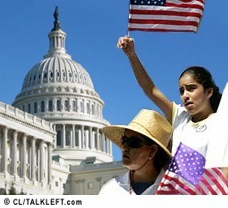 The ACLU and other civil rights groups have filed a class action lawsuit challenging Arizona's immigration law. "Arizona's law is quintessentially un-American: we are not a 'show me your papers' country, nor one that believes in subjecting people to harassment, investigation and arrest simply because others may perceive them as foreign," said Omar Jadwat, a staff attorney with the ACLU Immigrants' Rights Project. "This law violates the Constitution and interferes with federal law, and we are confident that we will prevent it from ever taking effect." The lawsuit will challenge Arizona's law on the grounds that it interferes with federal authority over immigration matters, and that it invites racial profiling against people of colour in violation of equal protection guarantees enshrined in the Constitution. 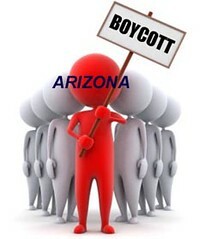 The boycott of Arizona hotels following the enactment of its terrible immigration law, S.B. 1070, is having an effect according to a new report. STR data shows Arizona hotels began losing business soon after the law was signed on 23 April....The Arizona Hotel and Lodging Association reported at least 23 meetings had been cancelled throughout the state, representing an estimated US$6 million to US$10 million in lost revenue. “The economic impact is increasing every day and every week. Groups that were considering us as an option are pulling out of Tucson and other Arizona cities,” said Richard Brooks, director of sales and marketing for the Westin La Paloma in Tucson. Groups that were considering holding meetings at the hotel for 10 years or more out are not considering Arizona now, according to Brooks. The city of Boulder will immediately suspend sending any employees to Arizona on business, and may take additional action against the state, in a show of opposition to its wide-reaching new immigration law. City Manager Jane Brautigam on Wednesday morning sent a memo to all department directors ordering them to cancel any plans to travel to Arizona for conferences or other city business, even if the tickets have been paid for.